Queen duvet cover (88" x 88") featuring the image "Fairmount Bagel In Montreal" by Carole Spandau. Our soft microfiber duvet covers are hand sewn and include a hidden zipper for easy washing and assembly. Your selected image is printed on the top surface with a soft white surface underneath. All duvet covers are machine washable with cold water and a mild detergent. 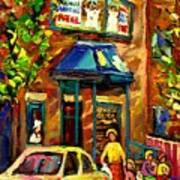 I've made a few trips to Fairmount Bagel to get the the best bagel's I've eaten. 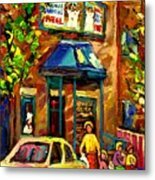 You've captured the bustling street scene that I always encountered, perfectly. Nice one Carole. Russ. I absolutely love this! Added to my favorites! A really bold and colorful view of the bagel factory.. I love those bagels..hot out of the oven.. I can almost smell them baking in this painting! 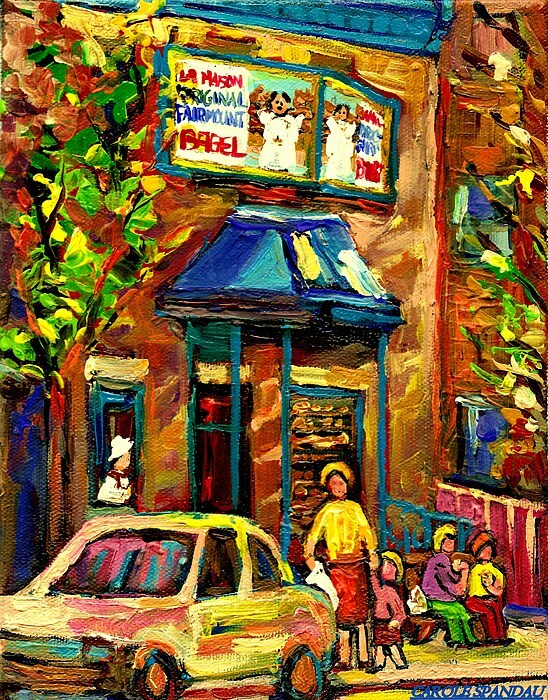 and the way you included the group of people outside.. because as we Montrealers all know quite well..... there are always people around Fairmount bagel at any time of day.. to buy a bag of their delicious bagels.. Carole once again, you've captured the mood on the streets of Montreal with your beautifully colorful painting! (now I am craving bagels..!!) ha!